An Ancient Solar System...: The Universe in 101 words: Does it snow on Mars? Above: Wintry frost on Mars, photographed by the Viking mission. I'm a bit... obsessed... with snow*. So it’s important I ask: Mars gets frosts in winter - but does it snow? In fact, it snows twice! Wispy clouds have been caught dropping falls of Earth-like ‘diamond dust’ snow. But a Martian water-ice snow fall is puny, a few tiny flakes here and there: The real Martian snow is the CO2 snow - cubic flakes formed by the planet's atmosphere itself freezing in the bitter Martian winter. * Blame it on Britain's ability to be freezing yet snow-less all winter, for years in a row. 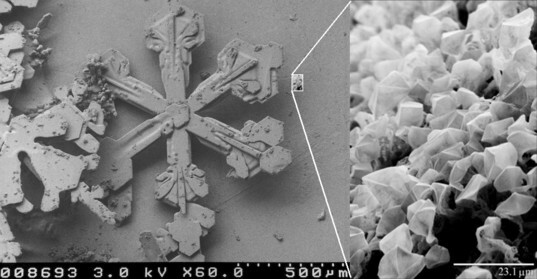 Above: Crystals of the two kinds of Martian snow - H2O on the left an CO2 on the right - side by side in an electron microscope super close up..